Tip Tuesday: To Grade or Not To Grade? Hey guys! I get asked about whether or not I record grades in our homeschool, and how I keep track of them as well. So that’s what we’re discussing in today’s Tip Tuesday. We’ve been homeschooling for 9 years now, and each year has been different. But we did decide to start grading our children a few years ago. And we’ll get into the how’s and why’s in the video below. I don’t grade in the traditional sense for preschool or kindergarten because I don’t want to discourage my kids, or create a negative feeling towards themselves or school in general. So for those younger grades, I like to do assessments to see how they’re doing. I do have assessment worksheets as well as grading sheets available in my Planners, as well as in my Letter of the Week preschool curriculum and K4/5 Kindergarten Curriculum that you can use to see how you’re child is progressing. But at that age I take the majority of responsibility to make sure they’re learning what they need to. That said, starting in first grade and on up, we do grade their work as well as share the results of their grades with them. We try to keep it a positive interaction between parent and child, and use their grades as a way to make sure that we’re doing our jobs as educators, and encourage and motivate them to work diligently and take ownership of their education as well. I always grade their work on the same day, and then hand it back and go over any corrections that need to be made as well as clear up any confusion on a specific lesson. They correct their work, then turn it back in, and then I enter the original grade into my homeschool tracking software. Tracking Grades: I’m currently using a very old version of Homeschool Tracker. I also have printable grading sheets in my downloadable lesson planners (Note the grade sheets are not in the daily or weekly day planners, only the planners marked “lesson planners”). 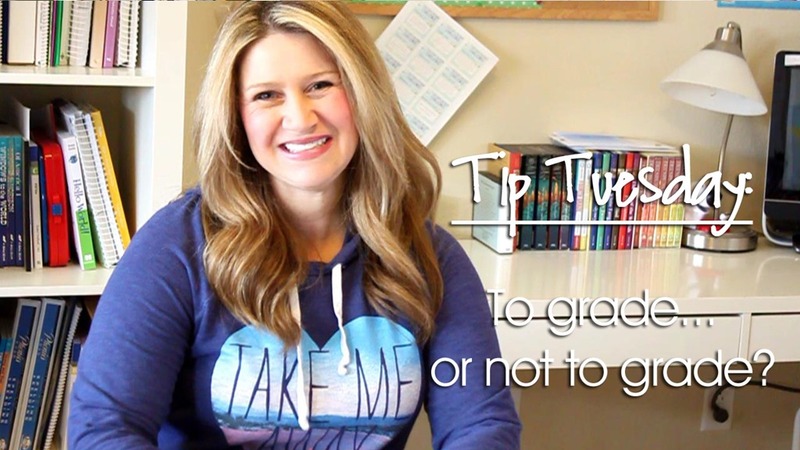 I’ll also do another video on tracking lessons and grades in another Tip Tuesday later on. 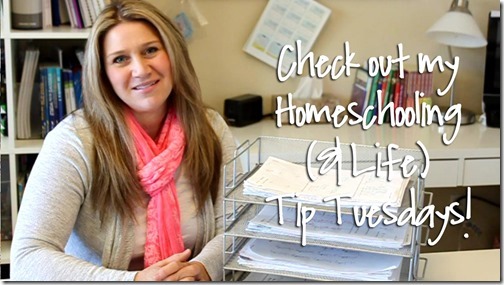 I hope you enjoy today’s Tip Tuesday video! Have an idea for a Tip Tuesday video or some helpful grading advice? Make sure to leave a comment below! Thank you! This is just what I needed! My 2 year old daughter watched with me ama said “she’s nice! ” thanks so much! 1. Higher probability students will revise their efforts based upon feedback – or at least consider them in preparation for the next assignment. 2. No arguing for more points on an assignment. 3. No worry about the time to complete the in class or out of class work if stymied; no deductions for late or incomplete. Time is an issue only to keep current with class, not to optimize score. Last year (second grade, technically) we started doing graded assignments and they helped my son tremendously. He’s really been able to see how his behavior and effort really do make a difference in how well he does. The concrete number in his written work now makes him stop and think about how he’s working with his online curriculum. When he’s having a poor day with multiplication and division facts game online, I’ll catch him stopping to sit up straight, clear his desk and chair of any blankets or distractions. Then there is also zero arguments when we need to review a topic, because he hasn’t “mastered” the points we’re focusing on yet. Also, it has lead him to be very motivated to self correct correct things like math problems and grammar work. We also have a bulletin board where we change out certificates and we have hand-made progress charts so he can see how much he’s growing, mentally. That being said, we don’t record them in any sort of book. There is no “final grade”, as him being able to correct the work is more important to us than necessarily getting it all correct the first time. We do, however, give assessments on reading and math at the end of the year here to assess how much he’s retained/grown in skill. This also helps me figure out what we need to revisit the next year or sometimes, topics we can skip all together because he’s learned them in his own time. Thank you, we are thinking of grading our going to be fifth grader next year. Might be a silly question, I downloaded your program you mentioned in the video (homeschool tracker basic); Do you input each subject as the kids complete the work and are graded? I was thinking of putting most of the subjects/assignments in over the summer (as I have a little more time then) and then just input the grade after they complete the assignment. Any thoughts would be great how people do their grading! Thanks! Yes, I add in all four of my kids. Then for each one I put in the subject and lessons for each subject. So for example my oldest will have Math U See Pre Algebra, then I put in Lessons 1-172 or whatever. I don’t put a ton of detail. If I need that I just refer to the TM. But that way I can track the hours, attendance and grades. Hi Ericka, I really appreciate so much of what you do. Thank you! I have been homeschooling a few years now, but I have not been grading. Honestly, I feel a bit overwhelmed by it! I watched your video, and I am still trying to figure out what will work best for me. I have 4 kids, but my older 2 would be the only “graded” students this next year (4th, 2nd). 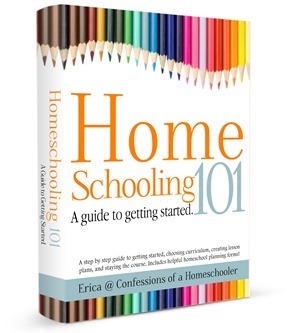 I looked into HomeschoolTracker, which seems so helpful. But I was curious about putting in assignments. It seems like it would take FOREVER to type in each assignment they ever do. Is that how it works? We use Math U See, and I also do Sonlight (Hist/Bible/LA). Would you recommend entering in each math page and each little assignment that Sonlight has my child do? Their LA Sonlight worksheets each week have some short and some longer assignments. They are split into parts A-D mostly for each week day. Would you just do a weekly grade for that? Would you grade writing assignments separately? And if we do something with our Jr. Notebooking Journal for our Apologia science book, how do I keep track of that? Do I just do weekly grades to make it simpler? So sorry I seem so confused and overwhelmed! I appreciate any amount of advice you have…small tips or lots of info! Thanks for all you explain in your blog! The one I use will auto-create several lessons for you at once, so it doesn’t take that long to input. Some of them you do have to put in one lesson at a time, and yes, I think that would take awhile 🙂 I do grade each math worksheet they do, then they get a grade for their test as well. I use IEW and we grade the sheets as directed there, so they get grades for their final writing assignments. For Apologia science I’m not sure how to grade them as we haven’t used it. I would probably just do grades for each assignment they turn in.